Question: Our coach has us doing squats so deep that our hamstrings sit on our calves and that makes my lower back and knees sore. The reasoning is that that we have to go deep to be effective. Is that the best way to do squats? Answer: We call those “rock bottom” squats and some people do feel that those are the most effective because they are full range of motion squats. If you’re doing those and using a light weight they can be effective for improving explosiveness. If you’re using heavy weights, and heavy is a relative term depending on your capabilities, it can cause the problems you’re experiencing. It’s become a popular notion because of the ” random exercise workout ” style of training and it is mistakenly thought to be effective for athletics. For squats you should be able to lower yourself to the point that your femur (upper thigh bone) is parallel or just below parallel to the floor. At that depth, your hip flexors and glutes are fully engaged and tight. They fire to drive you out of the bottom of the exercise. If you’re lower than that your pelvis slightly changes its angle in relation to your spinal column and your lower back can dip under your hips. That movement opens the discs slightly on the outside of your spine and compresses them on the inner side. Short term it means your back aches and long term with enough stress can cause disc damage. 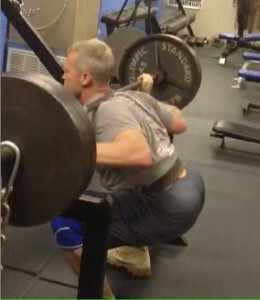 The depth also shifts the load slightly forward placing more stress on your knees. At the lowest point, your joints, tendons and ligaments are carrying the load instead of your muscles. Rule #1-don’t get hurt by using bad form. If your back and knees hurt by dropping too deep, make your coaches aware, and only lower yourself to parallel keeping the muscles engaged instead of loading your spine and knees. Random exercise workouts create random results. Some of the exercises used with the random training are useful if they are executed with good form. Training for athletes should be with a purpose and direction that translates to the sport you’re preparing to play. Remember this, not everyone is built with the same body mechanics. People have different bone lengths and ratios of leverage. If you have long legs and a long torso it’s often difficult to do deep squats because of the leverage factors which is where an understanding of kinesiology comes into play. Try to learn and understand your body type and what you’re physically capable of doing safely while challenging yourself to change and become better.